Apologies for the unavailability of the blog for past several days. The ACHUKA server was apparently becoming overloaded and the highest traffic area of the site had to be temporarily disabled to maintain stability of the rest of the ACHUKA site. I am happy to report that the whole site has now been reinstated on a new more powerful server. I am personally finding the site responds a lot more quickly and everything seems to be functioning well. But when a site is moved from one platform to a slightly different platform I'm aware that somethimes internal links can become garbled, so please report anything that you find not working properly. I'm not aware of anything Big & Bloggable that has happened in the past week, but if there was anyhthing that you think should have been reported here, give me a nudge. I'll be catching up with the weekend reviews shortly. I'm very partial to a fig roll or two - indeed, I survived many a weekend as a university student on a packet of rig rolls, a loaf of bread and some peanut butter - so this article caught my eye. Unfortunately I'm not able to think of a children's books connection. Perhaps a blog reader can oblige? but good to read also that "Book reviews (presumably including children's reviews) will move from the magazine back to the newspaper, this time in the Life & Arts section..."
It's a rare skill to be able to bring a fictional family so convincingly to life, and with such humour, too. This is what puts Jacques Couvillon in the ranks of Frank Cottrell Boyce and the Australian writer Martine Murray. By the end of the book we've been so completely and convincingly drawn into Don's world - his family, his on-off relationship with his friend Leon Leonard, his dreams and ambitions - that he lives on beyond the story. Maurice Sendak is widely recognised as an outstanding children's author, but he is more than that. He is an artist whose flair for visual storytelling is almost unmatched today. Jonathan Jones paids tribute in last weekend's Guardian magazine. Very Highly Recommended, especially for the suggestions of possible influences, from Hogarth to Oldenberg and Runge. "As adept storytellers and masters of their craft, these writers employ great lightness of touch in dealing with eternal themes from an historical perspective. Each one illuminates something different about the world we live in today, making the past accessible and relevant to the present. This is strong, imaginative writing for young people that unlocks history way beyond the classroom." "2008's shortlist is a really delightful mixture reflecting the very best of the quality of illustrators at work at the moment. There are a mixture of techniques, styles and appeal reflected in this very strong shortlist - something for everyone who appreciates the illustrator's art from babies to adults." Jodie Foster grew up on-screen in the 1970s, acting beyond her young age in such films as "Taxi Driver" and "Freaky Friday." Now Abigail Breslin, who starred in "Little Miss Sunshine," is doing the same. Jodie Foster and Abigail Breslin co-star in "Nim's Island." The two were brought together for the adventure comedy "Nim's Island," opening Friday, a film adaptation of the 2002 children's book by Australian Wendy Orr. Hawkins had "quite a magical childhood": her parents, Jacqui and Colin, write and illustrate children's books, and Sally and her older brother were immersed in their irreverent world of fairy-tales, pirates and witches. "They were always drawing, and it was incredibly creative to be around that," says Hawkins. "I was encouraged to draw and paint and express myself and create things. And I wasn't pushed academically; I could just be what I wanted to be. My parents have a strong work ethic, but their attitude to life, their philosophy, is: whatever makes you happy." "I wanted to write a story children would want to get into," she says. "I wanted parts that were lovely, warm and magical to balance off the sinister bits. And I love doing scenes lit from within or without. Like the scene in Hardy's The Return of the Native where Clem Yeobright and Damon Wildeve are dicing on Egdon Heath at night, lit by glow-worms. I have... set-pieces I want to do and then I join them up like a string of beads. I even do it with the crime novels." I missed this piece by Nicolette Jones when it was published in the Telegraph back in January. Blogging it now as it's such a useful review of recent young adult novels about the holocaust and different views of the subject. 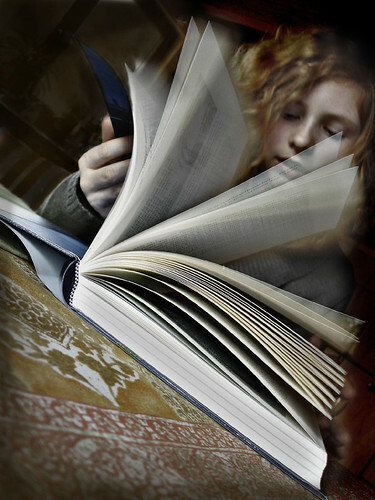 creative reading, originally uploaded by panta rhei. Anyone who loves Montgomery's original books (she went on to produce a whole series) will probably be able to read this prequel without minding the occasional jarring note. What may grate, though, is the cover design in which the UK publishers have clothed this Anne of Green Gables for a new generation. While the story works hard towards achieving historical and geographic authenticity, Puffin has given us Anne as a deracinated figure in what appears to be modern dress. But why did they stuff their mother? Missed this over a week ago. Reviews by Geraldine Brennan. Interesting Guardian blog discussion about reviewers and reviewing, with contributions by Adele Geras, Meg Rosoff and (just now if briefly) myself.